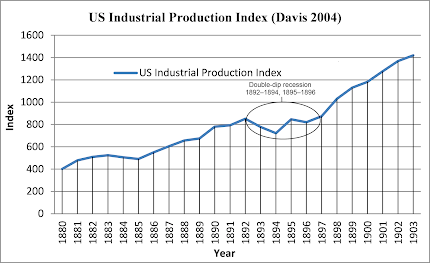 Davis (2004: 1189) provides a new index of US industrial production. 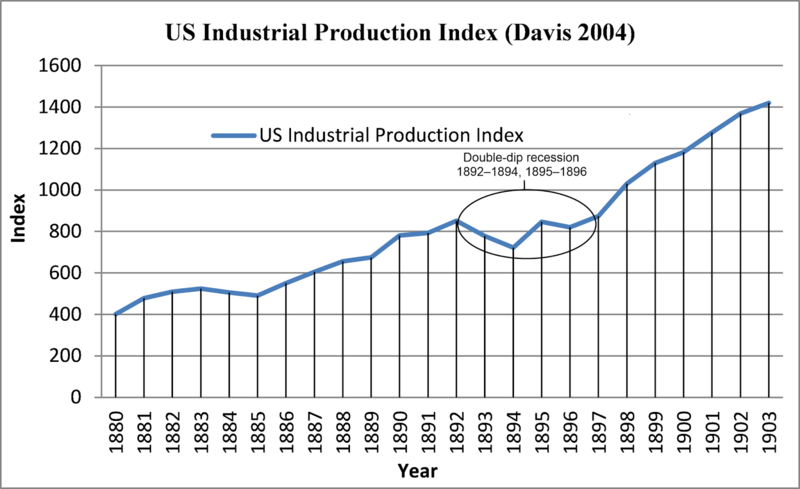 Davis used 43 annual components of manufacturing and mining industries in the US, which represented about 90% of manufacturing output in the 1800s (Davis 2006: 105), so that his index seems to be a reasonably good proxy for real US GDP, and certainly in the late 19th century when the manufacturing sector had become a dominant part of the US economy. We can see a graph of Davis’s index for the years from 1880 to 1903 below. 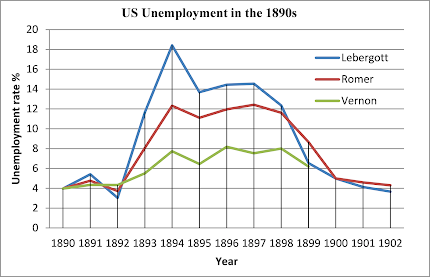 Davis (2006: 106) finds that the US had a double-dip recession from 1892–1894 and in 1895–1896. Balke and Gordon (1989: 84) essentially support this, and also find recessions roughly in these years. 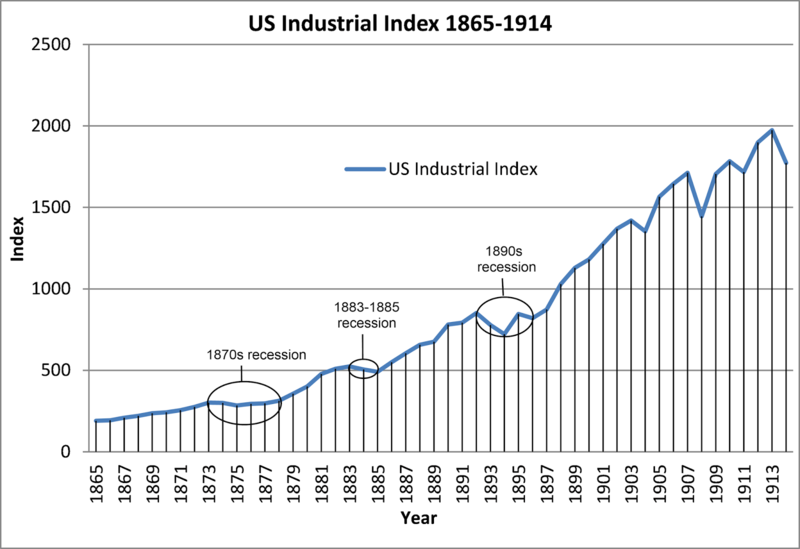 To put the double-dip recession of the 1890s in perspective, we can see a broader version of US industrial production index from 1865 to 1914 below. As we can see, the real output contraction was the most severe of the late 19th century. 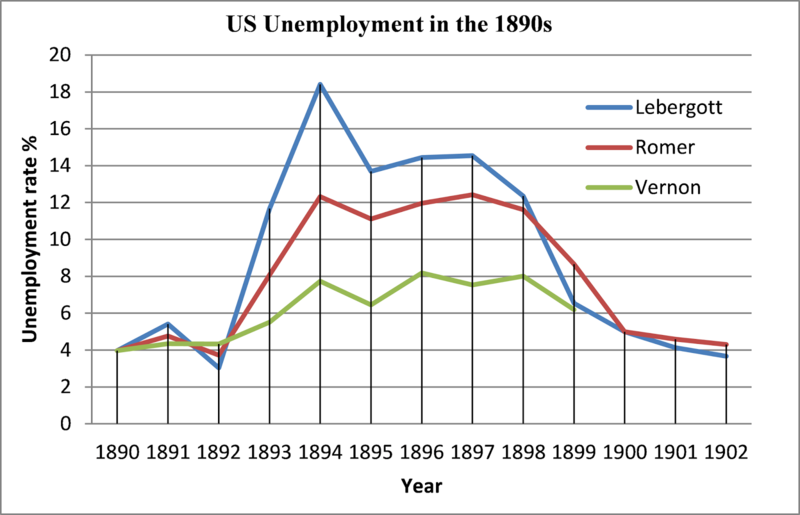 We have already seen in the previous post that we have reason to think that Lebergott’s estimates of the unemployment rate in the 1890s are probably better than other estimates, and they can be seen below. Unemployment clearly soared in these years, and the US experienced a severe economic crisis. The unemployment shock was quite comparable to that in the 1930s (even if not as bad), and it was not until 1901 that unemployment came down to about 4% – the percentage normally taken to be a rough approximation of full employment. Davis, J. H. 2004. “An Annual Index of U.S. Industrial Production, 1790–1915,” Quarterly Journal of Economics 119.4: 1177–1215. You want to estimate the unemployment rate? You can do it with that index. Take the index as a proxy for GDP. Then apply Okun's Law. It's one of the better statistical regularities in economics. But does Okun's Law assume that labour force participation rates are procyclical (as in the post-1945 period)? There is evidence that they were countercyclical in the sense of rising during recessions before 1914. Does this render unemployment estimates by means of Okun's Law questionable for the 19th century? My back of the envelope Okun's Law estimate is getting Romer's numbers. Of course, Okun's Law is a regularity. It does not always hold. But it might be worth some consideration. "My back of the envelope Okun's Law estimate is getting Romer's numbers." This could well be the case. Okun's Law is really only a rule of thumb and it only really works in the post-war era. I'm just throwing it out there. When working in the dark... try everything. I still think wages are the most reliable indicator on this. They are easy for historians to track -- much easier than unemployment! -- and they will tell a story. Out of curiosity, Lord Keynes, have you seen any of the following scholarly articles that deal with U.S. financial economic history in the 19th century? All of them involve the same scholar, who specializes in this domain, but I thought you might be interested in reading them. I have supplied the citation for each article in Chicago Style, and provided a link to the article directly beneath each citation. Hoag, Christopher, and Stephen Norman. "Transatlantic Capital Market Price Discovery During a Financial Crisis." Bulletin of Economic Research 65, no. 1 (2013): 1-9. Hoag, Christopher. "Clearinghouse membership and deposit contraction during the Panic of 1893." Cliometrica 5, no. 2 (2011): 187-203. Hoag, Christopher. "The Atlantic telegraph cable and capital market information flows." The Journal of Economic History 66, no. 2 (2006): 342-353. Hoag, Christopher. "Deposit drains on “interest-paying” banks before financial crises." Explorations in Economic History 42, no. 4 (2005): 567-585.